I've enjoyed photography all my life and purchased my first SLR camera in the early 70's. 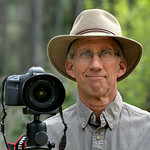 Starting with film, I enjoyed capturing wildlife and nature, but worked mostly with portraits at that time. I began developing in my own darkroom and learned the artistic creation that was possible there, particularly with black & white. I moved away from my hobby in the 90's as the digital revolution began and although easier to take and store photos, the quality was not there. I've recently had a resurgence in my interest in digital photography because technology is again returning the quality that I so much expect. Many of the photos in my galleries are award winning photos, with a number of them, contest winners. My photos have appeared in several magazines and been displayed in art galleries in northern Colorado, New York City and the United Kingdom. One of my images is displayed in very large format as an entrance wall at Castlewood State Park near Franktown, CO. I have recently resparked an interest in portraits by shooting WWII era fashion with a number of models who have become personal friends. I truly appreciate the help and companionship they’ve offered. I am pleased to share and make available to you, some of my work. Some photos have been cropped and are not suitable for large prints. Please take a look at the larger views before ordering. Additional charges will apply for all orders shipped outside the US. Please feel free to contact me by email, blairwacha@hotmail.com with any questions.